Fighting hospital-born infections starts with simple hygiene. While operating rooms are one of the most sterile places in the world – where special procedures and chemicals keep instruments and the doctors and nurses who use them perfectly clean – it’s a small space within a hospital. Other areas of open hallways and waiting rooms are near impossible to keep so perfectly germ-free. 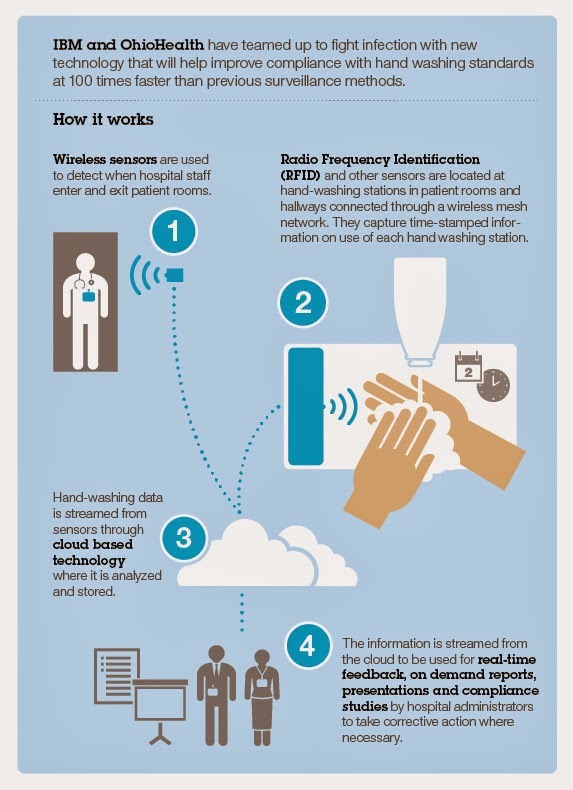 So, as medical professionals move from room-to-room, even hospital-to-hospital, IBM Research and OhioHealth are using sensors to help analyze hand hygiene no matter where they meet their patients. The Center for Disease Control and Prevention estimates that nearly 2 million hospital patients in the United States contract hospital-associated infections (HAI) each year, and 90,000 of those patients die as a result. These bacteria, particularly two culprits: Clostridium difficile(a bacteria, that when ingested, causes illness), and Methicillin-resistant Staphylococcus aureus, or MRSA (a bacteria that can be picked up by merely touching something that’s infected), also cost $4.5 billion in annual healthcare costs. LMT sensor above hand-washing station. Hand washing could prevent much of this infection spread. But studies have shown when healthcare professionals step out of an operating room, they only wash their hands about half the time that they should, such as when visiting a patient’s room. Hospitals are asking: how do we elevate hand washing compliance levels? OhioHealth, a group of non-profit Ohio-based hospitals, is working with scientists at IBM Research to make hand washing high tech – at least in how doctors and nurses are nudged to wash when visiting their patients. The IBM team led by Dr. Sergio Bermudez set up Low-power Mote Technology (LMT) sensors near hand-washing stations. They unobtrusively and passively receive and send signals from a hospital staffer’s RFID-enabled work badge. * The LMT knows when a staff member entered the room, knows if he or she used the hand-washing station, and then transmits the data for compliance processing. A web page provides the doctors, nurses, managers and executives with hourly compliance levels by staff ID, and a weekly report summarizes the compliance levels per ID, job role, work shift, floor, and hospital. This test project covers two floors at one of OhioHealth’s hospitals. Each floor has about 100 sensors at room entrances, in hallways, and at each hand-washing station. A gateway gathers and sends the data to a cloud server (so no hospital IT infrastructure is used). The server then analyzes the data and generates those hourly and weekly reports. A future implementation might include “guest tags” given to visitors – they need to wash their hands, too! Hand hygiene compliance levels could also scale out to provide a risk metric that indicates the potential for spreading an infection, given the compliance levels of healthcare workers at a given time, and their interaction with patients. The next phase in the current work with OhioHealth is to reduce the size and cost of the sensors; increase the system’s sensing reliability; and move from prototype to product. 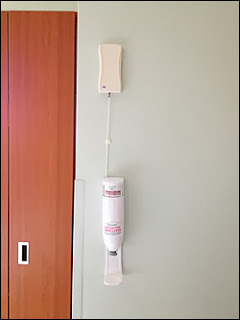 * — The OhioHealth staff was given the RFID-enabled tags as their current badges do not currently use RFID technology.